Although Eugène Boudin always felt particularly attached to his native Normandy, where he regularly worked, in the middle of the century he began to travel frequently around Brittany and northern France, Belgium and the Netherlands. 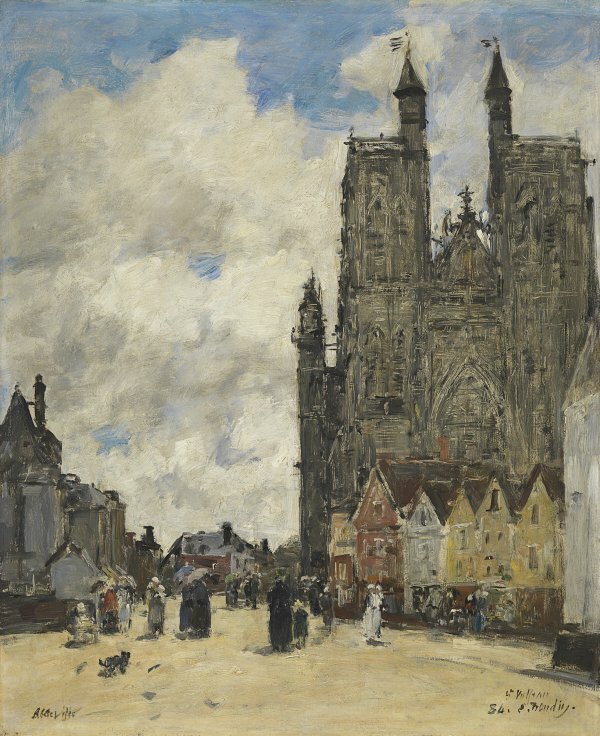 In 1884, while staying in Abbeville, a town north of Amiens in the region of Picardy, he produced this small panel painting of an urban scene entitled The Square of the Church of Saint Vulfran. The rigid, geometrised façade of the flamboyant Gothic style church that dominates the right side of the painting contrasts with the fluidity of the clouds, which occupy most of the left-hand side of the composition on account of the very low horizon line and envelop the entire painting with their luminosity.